**** Chosen by Winner: Daniel M.
The GPB1 folding knife is a collaborative project between Kizer and custom knifemaker John Gray. The GPB1 or Gray's Pocket Brute 1 is based off his custom Thuck design which pairs a slender handle with a wide, harpoon-like blade which is more than enough to get any job done. The 3.5" drop point blade is made from CPM-S35VN stainless steel with dual angled thumbstuds for more positive purchase. 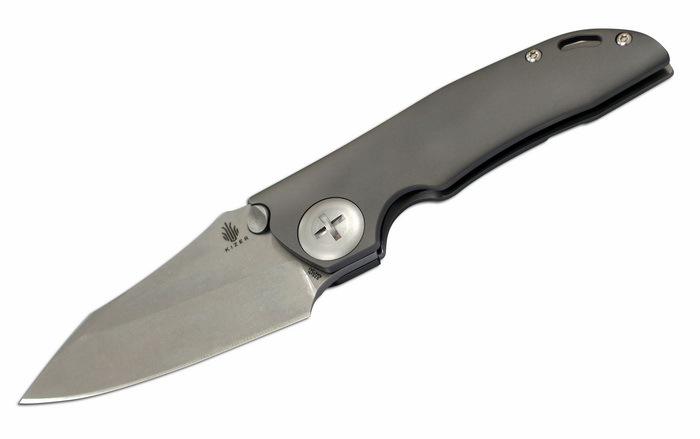 The bearing pivot system allows for smooth blade opening, as with all Kizer knives. The ergonomics of this milled titanium handle are absolutely fantastic and really lock this knife into your hand extremely well. It features an overlarge Philips head pivot (just like the custom), lockbar overtravel prevention mechanism, replaceable steel insert, lanyard slot, pocket clip and is a great sized folder for every task that is built with a quality anyone can appreciate.